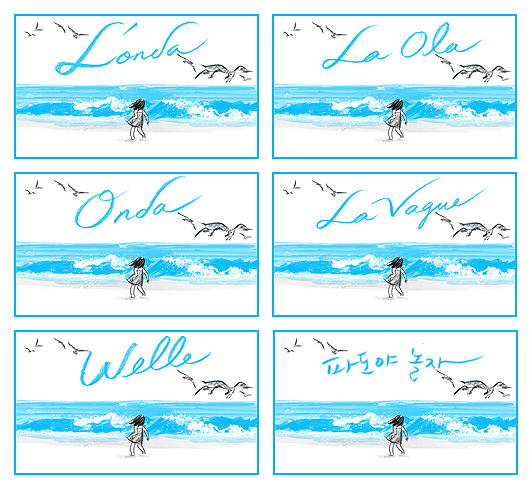 "Wave" has come out --"파도"가 출간되었습니다. Publisher: Chronicle Books, San Francisco, U.S.A.
*The Italian publishing rights are sold to Corraini, Italy. *The Spanish publishing rights are sold to BARBARA FIORE EDITORA, Spain. 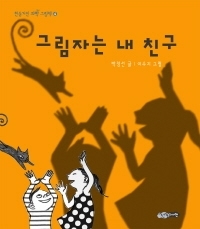 "Five gulls and a little girl play with the tide in this beach adventure that lacks text but provides plot aplenty. Nineteen beautiful blue-and-gray 24" x 7" acrylic-and-charcoal illustrations tell the story sublimely. 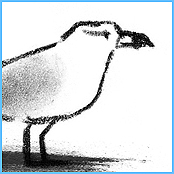 A line of birds follows the barefoot girl to the edge of the shore, and the gently rolling tide chases all six of them several feet up the beach. A dance begins; forward, back. The composition uses the gutter to great effect, placing the gray-sketched girl and gulls on the left-hand page while the liquid blue ocean laps ever closer on the right. The girl splashes and plays in the shallow waters, birds swirling in the sky above her. Then a huge wave rears up and tumbles over her. For a minute, she's stunned, then awestruck and excited to find the beach littered with beautiful shells that weren't there before, blue ocean saturating gray land. Gulls in the sky react happily as well, wheeling against the now-azure sky. When mother comes to fetch her, the girl gives the ocean a secret wave goodbye. Simply spectacular." "Lee's wordless picture book perfectly captures a child's day at the beach. Followed by a flock of seagulls, a girl runs delightedly to where waves break on the shore. She surveys the sea and together they begin a silent dance. She chases it as it recedes, runs from it as it surges, splashes in it when it calms, taunts it as it rises, and finally succumbs to it crashing down upon her and discovers what treasures the waves can bring. A panoramic trim size beautifully supports the expansiveness of the beach, and Lee uses the gutter to effectively represent the end of the shoreline-until the girl crosses that line. Loosely rendered charcoal and acrylic images curl and flow like water and reflect playfulness, especially in the facial and bodily expressions of the child and seagulls. The use of blue in an otherwise gray-toned world calls attention to the ocean, which rivals the girl as a main character in this story. Wave is best shared in small groups for the younger set, but also suited for solitary enjoyment by older children. A simple, well-crafted story of friendship." AUGUSTA, GA. - Visual artist Suzy Lee isn’t a writer, but her children’s books still tell a great story — all without words. 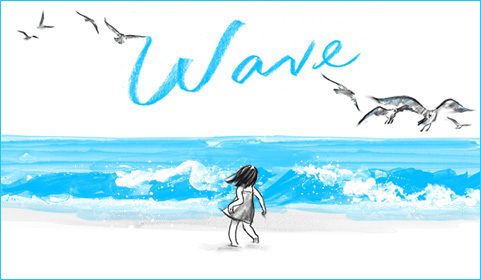 Her newest release, “Wave,” follows a nameless young girl as she spends a day at the beach. While the artwork is designed simply, using just two shades of watercolors, the pages positively glow. Everywhere you look there is movement, life and laughter. Lee was born in Korea and lives in Singapore, and her illustrations are vaguely reminiscent of the literati paintings of the Joseon dynasty, considered the golden age of Korean painting. And yet, her use of simple forms and white space brings cleanliness and modernity to the pages. With just a few strokes, she is able to create a scene of wild wonder and sound. No words are necessary to bring to mind the roar of the sea and the call of seagulls, and “Wave” is a perfect example of a situation in which children can use their own imaginations to give life and context to the scenes. But “Wave” is more than a children’s book. Each page is a study worthy of framing. The wild blue sea rages on the right, while a curious little girl herds seabirds on the left. Lee balances each page with its facing mate, making creative use of the gutters as shoreline until the two merge with comic — and universal — results. Use the book for class story time, or for an artistic study. Lee’s beautiful book works for either purpose.